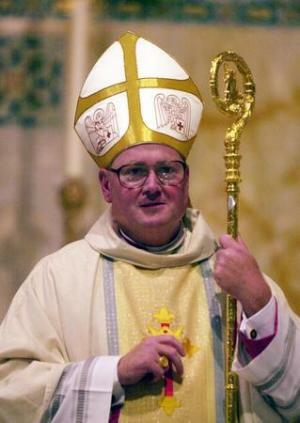 Archbishop Timothy Dolan has been announced the 13th archbishop of Archdiocese of New York. First, the Archdiocese of New York is a very important, high-pressure, and very visible spot in American Catholicism. Archbishop Dolan is the fire in the belly, so to speak. Second, it is a phrase he used to describe some priests in the Milwaukee Archdiocese who didn’t respond well when he gave a reflection on what it means to be “in persona Christi.” Some clergy, apparently, were more interested in higher pay and so forth. He claimed such priests had lost the “fire in the belly” that is necessary of a priest. True enough. Archbishop Dolan’s book, Priests of the Third Millennium, is a true masterpiece. You can tell from the book that he really “gets it.” He is a people person, and he a fine ability to lead. Most important, though: he understands and fully loves the Church, Jesus, and the priesthood. The Church in the Archdiocese of New York is in good hands. Let’s pray for him as he makes this transition. On a related note, the National Catholic Reporter has an article online concerning this appointment in regards to how it adds to a pattern in Pope Benedict XVI’s U.S. episcopal appointments. The argument is that Pope Benedict’s strategey is to “name archbishops identified with the center-right, but men with reputations as consensus-builders rather than ideologues – hence “the center-right with a human face.” GOOD! This entry was posted in Catholic News, Priesthood. Bookmark the permalink. Yes, it has to be both!